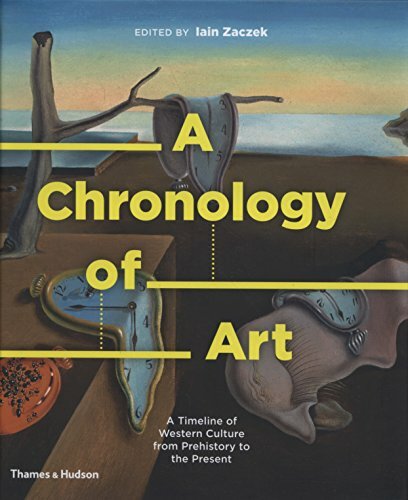 A Chronology of Art: A Timeline of Western Culture from Prehistory to the Present is a survey of the key catalysts of art history, and history in general, presented in a quick-reference timeline format. Joining together 32,000 years of artwork, A Chronology of Art organizes an abundance of facts and figures into five broad categories: Ancient & Medieval, Renaissance & Baroque, Rococo & Neoclassicism, Romanticism & Beyond, and The Modern Era. While Zaczek himself provides some content, he pulls in six additional contributors, including Ian Chilvers, Emma Doubt, Ann Hildyard, Susie Hodge, Ann Kay, and Carol King, who offer introductions, summaries and sidebars in their fields of expertise. There is good balance between these varied participants and the information they present in timelines, images, text, and sidebars. Color images abound. They are in full force along the timelines as well as the represented features in various highlights pages. While the standard paintings are included as one would expect (Botticelli’s The Birth of Venus; David’s Oath of the Horati; Raphael’s Madonna in the Meadow; Vermeer’s The Milkmaid; etc. ), lesser known paintings and artists beyond the Dutch and the Italians were also selected, making this reference material more inclusive than most. In the mix along the various timelines are the concurrent political, economic, cultural, and religious historical milestones from around the world. While most dates will be obscure (1350 Pedro the Cruel became king of Castile and Leon; 1356 The Black Prince wins English victory over the French) it is fascinating to watch the world ebb and flow with power shifting from nation to nation all the while, decade upon decade, century upon century, artists continue with their expressions. The strength of this project is in the content of the more recent centuries. Between CE 500 and the 1990s the timeline range shifts from 100 year spans to 5 year spans with the bulk of the body of knowledge landing between 1800 and 1980. The prehistory ancient art section pales in comparison, lumping everything into two 15,000 year timelines. The years 3000 BCE to CE 500 are equally sparse allocating 1000 and 500 year time spans to describe artwork that is inevitably basic, and vague bordering on flippant. Similarly, there is another very general attempt made at classifying and including the diverse art forms (performance, film, installations) of our contemporary era (2000–2017). Taking a brave stab at this debatable and as of yet undefined period, King identifies only British artists Gilbert & George, Paul Cummins ,and Peter Blake in this timeline. Apparently the only U.S. art on this side of the 21st century worthy of inclusion is graffiti street art. From Philadelphia origins to British fame, in so far as Justin Bieber made Bansky’s non-extant 2002 Balloon Girl mural immortal by having her tattooed somewhere in the mix of his “body of artwork.” The fact that Bieber is even mentioned in an art history book is questionable. With a little bit of this and a little bit of that, A Chronology of Art puts art history in a very unique context. Art is never created in a vacuum, but is the direct output of a confluence of myriad facts and figures. Seeing these influences all together in a visual format is indeed thought provoking and interesting.